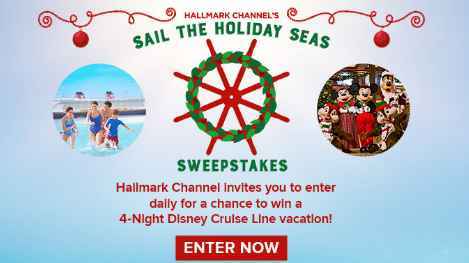 Enter the Hallmark Channel Sail the Holiday Seas Sweepstakes now through July 26, 2018 for your chance to win 4 night Disney Cruise Line Vacation for four people. 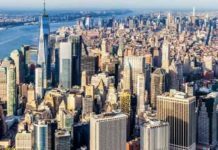 Trip Includes: Round trip coach airfare, Pre-paid gratuities, Free Dinner at Palo and more. How To Enter: During the sweepstakes period go to this link: hallmarkchannel.com/christmaskeepsake-week/sweepstakes and follow the online instructions to register by entering all information requested on the registration form and once you filled out the entry form now Click on the submit button to complete the registration form. Prizes: One grand prize winner will win a four (4) night Bahamian Disney Cruise Line trip for four (4). 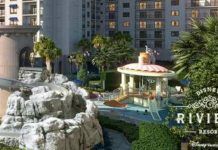 Trip Includes: Round trip coach airfare for 4, Five (5) day / four (4) night Cruise on the Disney Dream, One (1) $250.00 on-board credit for Senses Spa treatments, All meals onboard the Disney Dream for four, Pre-paid gratuities and more. ARV of all prizes is: $9,578.72. 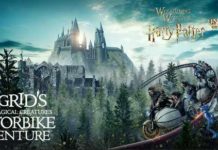 When To Enter: The Hallmark Channel Sweepstakes entry begins on July 6, 2018 at 9:00:00 AM PT and Thursday, July 26, 2018 at 8:59:59 PM PT. Who’s Sponsor: Crown Media United States, LLC, 12700 Ventura Boulevard, Studio City, CA 91604.